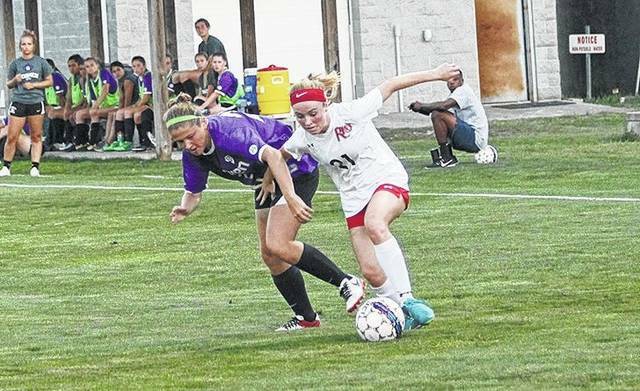 Rio Grande’s Payten Davis scored a pair of first half goals to lead the RedStorm in a 3-0 win over Goshen College, Saturday night, at Evan E. Davis Field. The win snapped a four-game losing streak for the RedStorm. RIO GRANDE, Ohio — Payten Davis scored twice in the game’s opening seven minutes to lift the University of Rio Grande to a 3-0 win over Goshen (Ind.) College, Saturday night, in non-conference women’s soccer action at Evan E. Davis Field. The RedStorm improved to 2-5 with the victory, snapping a four-game losing streak in the process. Goshen dropped to 3-4-1 with the loss. Davis, a freshman from Chillicothe, Ohio, scored what proved to be the only goal that Rio would need just 5:14 into the match when she gathered in a through-ball from sophomore Madi Bowers (Bexley, OH) and fired a shot from 10 yards out past Goshen net-minder Kadie Spoor. Just under two minutes later, Davis took a pass from fellow freshman – and cousin – Chase Davis (Huntington, WV) and beat Spoor in a 1-on-1 matchup after Spoor abandoned her line for a 2-0 RedStorm lead. That’s how things stayed until sophomore Daniella DeSousa (Cape Town, South Africa) set the final score with a goal off an assist by junior Kaylynn Bell (Hillsboro, OH) with 14:16 left in the contest. Rio Grande finished with an 18-7 edge in shots, including a 13-1 advantage in the second half, and a 9-3 cushion in shots on goal. Junior Andrea Vera (Quito, Ecuador) had three saves in goal for the RedStorm. Spoor recorded six saves in a losing cause for the Maple Leafs. Rio Grande returns to action on Thursday, opening River States Conference play at Brescia University.